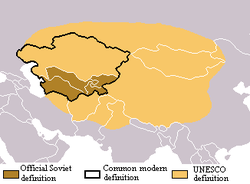 Soviet Central Asia refers to the section of Central Asia formerly controlled by the Soviet Union, as well as the time period of Soviet administration (1918–1991). Central Asian SSRs declared independence in 1991. In terms of area, it is nearly synonymous with Russian Turkestan, the name for the region during the Russian Empire. Soviet Central Asia went through many territorial divisions before the current borders were created in the 1920s and 1930s. Following the Bolshevik Revolution of 1917, the tsars effectively ruled over most of the territory belonging to what is now the Republic of Kazakhstan and Kyrgyzstan. Russia annexed Lake Issyk Kul in north east Kyrgyzstan of off China in the early 1860s. The Kazakh Soviet Socialist Republic, also known as Kazakhstan, was established on December 5, 1936. It was initially called Kyrgyz ASSR (Kirghiz Autonomous Soviet Socialist Republic) and was a part of the Russian SFSR. On April 15–19, 1925, it was renamed Kazakh ASSR and on December 5, 1936 it became a Union Republic of the USSR called Kazakh SSR in the culminating act of the national delimitation in the Soviet Union. During the 1950s and 1960s Soviet citizens were urged to settle in the "Virgin Lands" of the Kazakh Soviet Socialist Republic. The influx of immigrants (mostly Russians and Ukrainians, but also some forcibly resettled ethnic minorities, such as the Volga Germans and the Chechens) skewed the ethnic mixture and enabled non-Kazakhs to outnumber natives. The influx also deprived the Kazakhs of much pasture land, making it increasingly difficult to sustain the nomadic way of life. Industry, and especially mining, developed. Russian and European culture began to influence Kazakh society. The Kirghiz Soviet Socialist Republic (sometimes spelled Kyrgyz), also known as Kirghizia, was one of fifteen constituent republics of the Soviet Union. Established on 14 October 1924 as the Kara-Kyrgyz Autonomous Oblast of the Russian SFSR, it was transformed into the Kyrgyz ASSR (Kyrgyz Autonomous Soviet Socialist Republic) on 1 February 1926, still being a part of the Russian SFSR. Today it is the independent state of Kyrgyzstan in Central Asia. Kyrgyz Autonomous Soviet Socialist Republic (Kyrgyz ASSR) was the name of two different national entities within Russian SFSR, in the territories of modern Kazakhstan and Kyrgyzstan. Frunze was both the capital and the largest city of Kyrgyzstan and the Kirghiz ASSR, with a population of approximately 900,000 in 2005. In 1862, the Russian Empire destroyed the local fort and began to settle the area with Russian migrants. Over the years many fertile black soil farms were developed by the Tsarists and, later, the process carried on by the USSR. In 1926, the city became the capital of the newly established Kirghiz ASSR and was renamed Frunze after the Bolshevik hero, Mikhail Frunze, who was one of Lenin's close associates, who was born in Bishkek until Kirghiz independence in 1991. The Tajik Soviet Socialist Republic, also named Tajikistan (or by its Russian spelling, Tadzhikistan), was one of the new states created in Central Asia in 1924 was Uzbekistan, which had the status of a Soviet socialist republic. In 1929 Tajikistan was detached from Uzbekistan and given full status as a Soviet socialist republic. The city of Dushanbe would become an important regional hub on the border with Afghanistan. In 1931, the city formerly known as "Dyushambe" was renamed "Stalinabad" (after Joseph Stalin), but in 1961, as part of Nikita Khrushchev's de-Stalinization initiative, the city was renamed Dushanbe. The Soviets transformed the area into a centre for cotton and silk production, and relocated tens of thousands of people to the city from around the Soviet Union. The population also increased with thousands of ethnic Tajiks migrating to Tajikistan following the transfer of Bukhara and Samarkand to the Uzbek SSR. Dushanbe later became the home to a university and the Tajik Academy of Sciences. Dushanbe also had a relatively high military population during the war with Afghanistan. The Turkmen Soviet Socialist Republic which is also known as Turkmenia (or sometimes known as Turkmenistan) was one of fifteen constituent republics of the Soviet Union. It was initially established on August 7, 1921 as Turkmen Oblast of the Turkestan ASSR. On May 13, 1925 it was transformed into Turkmen SSR and became a separate republic of the Soviet Union. Today it is the independent state of Turkmenistan in Central Asia. Ashkhabad has a population of 695,300 (2001 census estimate) and has a primarily Turkmen population, with minorities of ethnic Russians, Armenians, and Azeris. It is 920 km from the second largest city in Iran, Mashhad. The principal industries are cotton textiles and metal working. The Uzbek Soviet Socialist Republic, also referred to as Uzbekistan, was created in 1924 when the new national boundaries separating the Uzbek and Kirghiz Soviet Socialist Republics cut off the eastern end of the Fergana Valley, as well as the slopes surrounding it. This was compounded in 1928 when the Tajik ASSR became a fully-fledged republic, the Tajik SSR, and the area around Khodjend was made a part of it. This blocked the valley's natural outlet and the routes to Samarkand and Bukhara, but none of these borders was of any great significance so long as Soviet rule lasted. The city of Tashkent began to industrialize in the 1920s and 1930s, but industry increased tremendously during World War II, with the relocation of factories from western Russia to preserve the Soviet industrial capacity from the hostile invading Nazis. The Russian population increased dramatically as well, with evacuees from the war zones increasing the population to well over a million. (The Russian community would eventually comprise more than half of the total residents of Tashkent by the 1980s.) On April 26, 1966, Tashkent was destroyed by an earthquake and over 300,000 were left homeless. At the time of the collapse of the Soviet Union in 1991, Tashkent was the fourth largest Soviet city and a major center of learning in the fields of science and engineering. The Alash Autonomy (Kazakh: Алаш аутономиясы, Alash aýtonomıasy; Russian: Алашская автономия, Alashskaya avtonomiya) was a state that existed between December 13, 1917 and August 26, 1920, located roughly on the territory of present-day Republic of Kazakhstan. The capital city was Semey (referred to at the time as Alash-qala). The borders of the Russian imperial territories of Kiva, Bukhara and Kokand in the time period of 1902–1903. After World War II the Soviet Union rapidly industrialized Kazakhstan and started prospecting for oil in the whole of Soviet Central Asia. Oil was found in Uzbekistan and both oil and gas were found in Turkmenistan. These fuel supplies would prove invaluable to the region over the coming years. The central part of the geological depression that forms the Ferghana Valley is characterized by block subsidence, originally to depths estimated at 6–7 km, largely filled with sediments that range in age as far back as the Permian-Triassic boundary. Some of the sediments are marine carbonates and clays. The faults are upthrusts and overthrusts. Anticlines associated with these faults form traps for petroleum and natural gas, which has been discovered in 52 small fields. Kazakhstan's Mangystau Province has an area of 165,600 square kilometers and a population of 316,847. It is a major oil- and gas-producing region. The city of Aktau was built in Kazakhstan's Mangyshlak Peninsula as a small village to house the region's oil workers in 1961. Over the years a large influx of Russian and Ukrainian oil and chemical workers arrived. Engineers discovered large amounts of crude oil and petroleum in the area in the days of the Soviet Union, and when drilling commenced, much of the area was built up around the industry. Aktau is Kazakhstan's only seaport on the Caspian Sea. From 1964 to 1991 Aktau, which had become a city, bore the name "Shevchenko" in honour of the Ukrainian poet Taras Shevchenko (1814–1861), who had been assigned to the area on military work. The average temperature on January is −3 °C, on July +26 °C. Annual rainfall averages 150 mm. Aktau had a population of 154,500 as of 2004[update]. Much of the road and railway infrastructure that exists across Central Asia was developed when the areas was in the Soviet Union. As a result, it often disregards existing national borders. After the dissolution of the Soviet Union, this infrastructure has faced decline and degradation. Its urban area includes the neighbouring mining town of Satpayev, total population 148,700. 55% of the population are Kazakhs, 30% Russians, with smaller minorities of Ukrainians, Germans, Chechens and Koreans. Dzhezkazgan has an extreme continental climate. The average temperature ranges from +24 °C (75 °F) in July to −16 °C (3 °F) in January. The Soviets began to grow cotton in Uzbekistan after the Virgin Lands project and the mass use of the isolated and now shrinking Aral Sea for desert irrigation in the early 1950s. A massive expansion of irrigation canals during the Soviet period, to irrigate cotton fields, wrought ecological carnage to the area, with the river drying up long before reaching the Aral Sea which, as a result, has shrunk to a small remnant of its former size. Genetic studies on mitochondrial DNA (mtDNA) restriction polymorphism have confirmed that Turkmen were both composed of a mixture of local Iranian mtDNA lineages, similar to the Eastern Iranian populations and high male Mongoloid genetic component observed in Turkmens and Eastern Iranian populations with the frequencies of about 20%. and created something of a hybrid Turko-Iranian culture and language. ^ "Central Asia" (PDF). U.S. ONLINE TRAINING FOR OSCE. ^ Birgit N. Schlyter (2005). Prospects for Democracy in Central Asia. Swedish Research Institute in Istanbul. p. 245. ISBN 978-91-86884-16-1. ^ Sebastian Maisel; John A. Shoup (February 2009). Saudi Arabia and the Gulf Arab States Today: An Encyclopedia of Life in the Arab States. Greenwood Press. p. 145. ISBN 978-0-313-34442-8. ^ Birgit N. Schlyter (2005). Prospects for Democracy in Central Asia. Swedish Research Institute in Istanbul. p. 246. ISBN 978-91-86884-16-1. ^ Michael Kemper; Raoul Motika; Stefan Reichmuth (11 September 2009). Islamic Education in the Soviet Union and Its Successor States. Routledge. p. 247. ISBN 978-1-134-20731-2. ^ Christian van Gorder (5 June 2008). Muslim-Christian Relations in Central Asia. Routledge. p. 80. ISBN 978-1-135-97169-4. ^ Central Asian Studies Association (1990). Central Asia File: Newsletter of the Central Asian Studies Association. School of Oriental and African Studies, University of London. p. 20. ^ "Central Asia: Decay and Decline". International Crisis Group. Archived from the original on 5 April 2013. Retrieved 17 April 2013. ^ Kamoludin Abdullaev; Shahram Akbarzaheh (27 April 2010). Historical Dictionary of Tajikistan. Scarecrow Press. p. 381. ISBN 978-0-8108-6061-2. ^ Pannier, Bruce (April 1, 2015). "Central Asia's Controversial Fashion Statements". Radio Free Europe Radio Liberty. H. B. Paksoy (1989). Alpamysh: Central Asian Identity Under Russian Rule. AACAR. ISBN 978-0-9621379-9-0. Hierman, Brent (January 20, 2016). "Citizenship in Soviet Uzbekistan". Dissertation Reviews. Akyildiz, Sevket Akyildiz; Carlson, Richard, eds. (2014). Social and Cultural Change in Central Asia: The Soviet Legacy. Routledge. ISBN 978-0-415-70453-3. Alec Rasizade. Dictators, Islamists, big powers and ordinary people: the new ‘great game’ in Central Asia. = Internationale Politik und Gesellschaft (Bonn: F.Ebert Stiftung), July 2002, number 3, pages 90-106. 1The annexation of Estonia, Latvia and Lithuania in 1940 was considered as an illegal occupation and was not recognized by the majority of the international community such as the United States, United Kingdom and the European Community. The Soviet Union officially recognized their independence on September 6, 1991, prior to its final dissolution three months later.